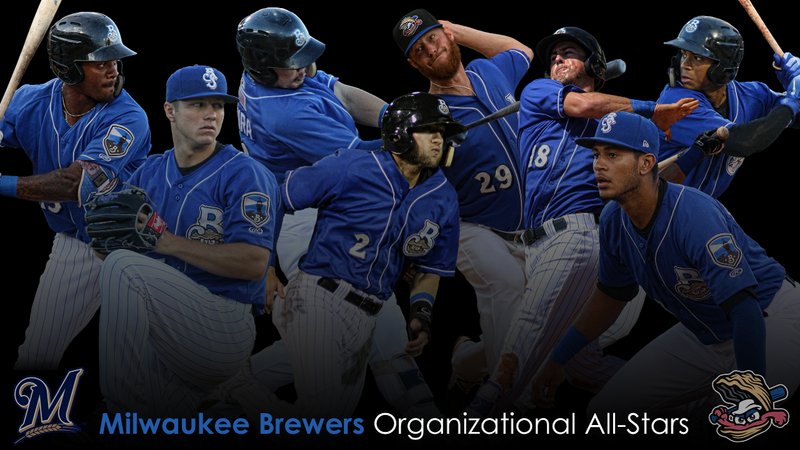 Eight members of the 2018 Biloxi Shuckers have been named to the 2018 Milwaukee Brewers Organizational All-Star Team. Biloxi has now produced 23 Brewers Organizational All-Star selections in just four years on the Mississippi Gulf Coast. A 2018 Southern League Mid-Season All-Star, Gatewood slashed .244/.302/.466 in 94 games with the Shuckers. The Clovis, CA native collected 19 doubles, a triple, a career-high 19 home runs and 59 RBI before his season was cut short by an ACL injury on July 25. Taken with the 41st overall pick by the Brewers in 2014, Gatewood was named the Southern League Player of the Week on May 27 after collecting a Minor League leading seven extra-base hits during the week of May 21-27. It is the second consecutive season Gatewood has earned a spot on the Brewers Organizational All-Star Team. Ranked as the Brewers' number one prospect, Hiura was central to the Shuckers playoff push, slashing .272/.339/.416 in 73 games with Biloxi. In just his second professional season, Hiura pounded out 18 doubles, two triples, six home runs and 20 RBI while scoring 36 runs in his campaign with the Shuckers. Between Biloxi and High-A Carolina, Hiura hit .293 with 34 doubles, five triples and 13 home runs, driving in 43 runs. Selected with the ninth overall pick in the 2017 draft by the Brewers out of UC Irvine, Hiura was named a 2018 Carolina League Mid-Season All-Star, the Carolina League Player of the Month in May and participated in the 2018 MLB Future's Game at Nationals Park. This is the second consecutive season Hiura has been named to the Brewers Organizational All-Star Team. In his first season in the Brewers organization, Hager put together his best campaign since 2012, hitting .292/.371/.521 in 64 games with the Shuckers before a promotion to Triple-A Colorado Springs on June 21. Hager was named a 2018 Southern League Mid-Season All-Star after notching 18 doubles, a triple, ten home runs and 40 RBI. His ten home runs tied a career high, and the 2011 first-round pick became the first player in Shuckers' history to homer in four consecutive games, hitting five dingers in four games from June 7 to June 10. This is the first time Hager has been named an Organizational All-Star after spending the first six seasons of his career in the Tampa Bay Rays organization. Another player in his first season with the Brewers, Moore scorched the Southern League in his 24 games with Biloxi, slashing an incredible .373/.429/.639 with seven doubles, three triples, three home runs and 18 RBI. Moore was promoted to Triple-A Colorado Springs on May 3 and finished the season hitting .299 with 31 doubles, nine triples, 14 home runs and 58 RBI in 121 games between Double-A and Triple-A. This is the first Organizational All-Star honor for the 26-year-old, who was also named to the 2018 Pacific Coast League Mid-Season All-Star squad. Following the 2018 season, Moore elected free agency and signed with the Seattle Mariners on November 9. Ray adds another award to his stellar 2018 season after he was named the 2018 Southern League MVP, a 2018 Southern League Mid-Season and Post-Season All-Star, and the Brewers Minor League Player of the Year. The fifth overall pick in the 2016 draft slashed .239/.323/.477 with 32 doubles, seven triples, 27 home runs and 74 RBI in his first season at Double-A. His 27 home runs and 37 stolen bases were the most in the Brewers organization and the Southern League, and he became the first player in Southern League history to lead the league in both homers and stolen bases in a season. Ray also paced the league in extra-base hits with 66, total bases with 254 and at bats with 532. This is the first time Ray has been named an Organizational All-Star. Outfield - Troy Stokes Jr.
As Biloxi's everyday left fielder, Stokes Jr. combined a dangerous bat with exceptional defense to earn his first Organizational All-Star nod. The 22-year-old outfielder slashed .233/.343/.430 with 23 doubles, six triples, 19 home runs and 58 RBI in 129 games, while drawing a career-high 65 walks. He finished third in the Southern League in extra-base hits with 48 and tied for fourth in home runs and walks. Additionally, Stokes Jr. was honored with theMiLB Gold Glove for left field back in October. The 2018 Southern League Most Outstanding Pitcher and Brewers Minor League Pitcher of the Year, Brown put together his most complete season as a professional with the Shuckers in 2018. The righty made 22 appearances, 21 starts, compiling a 9-1 record with a 2.44 ERA in 125.1 innings of work, walking just 36 while striking out 116. A fifth-round pick in 2016 out of Kentucky, Brown produced career-best numbers in wins, ERA, innings pitched, strikeouts, games started, batting average against (.207) and WHIP (1.04). He led the Southern League and Brewers organization in ERA, and the Shuckers compiled a 20-2 record in games in which he made an appearance. This is the first Organizational All-Star honor for Brown. Promoted to the Shuckers on July 29, Roegner made five starts with Biloxi in 2018. The lefty earned his promotion to Double-A after going 9-5 with a 2.16 ERA in 19 starts for the Carolina Mudcats. Between both levels, Roegner posted a 2.83 ERA, the lowest ERA by a left-handed starter in the Brewers organization, over 130.1 innings while striking out a career-high 88 batters. The 2016 pick out of Bradley started the Carolina League All-Star Game and was named the Carolina League Pitcher of the Week for May 13. This is his first Organizational All-Star recognition. Shuck Nation memberships and group outings for the 2019 season are on sale now and are available for purchase by calling 228-233-3465 or visiting biloxishuckers.com.